D. (Section 1.21) Premises: That area consisting of approximately _______ rentable square feet, the address of which is __________, ________, CA ________, within the Building as shown on Exhibit B.
E. (Section 1.22) Project: The land and improvements shown on Exhibit A consisting of one (1) building(s) the aggregate area of which is approximately ________ rentable square feet. (Section 1.7) Building: The building in which the Premises are located known as ________, ________, CA ______ containing approximately ________ rentable square feet. Exhibit H (Option to Extend – Fair Market Value). This Lease (“Lease”) is dated, for reference purposes only, as of the Lease Reference Date specified in Section A of the Summary of Basic Lease Terms (“Summary”), and is made by and between the party identified as Landlord in Section B of the Summary and the party identified as Tenant in Section C of the Summary. 1.2 Additional Rent. The term “Additional Rent” is defined in Section 3.2. 1.3 Address for Notices. The term “Address for Notices” shall mean the addresses set forth in Sections R and S of the Summary; provided, however, that after the Commencement Date, Tenant’s Address for Notices shall be the address of the Premises. 1.4 Agents. The term “Agents” shall mean the following: (i) with respect to Landlord or Tenant, the agents, employees, contractors and invitees of such party, and (ii) in addition with respect to Tenant, Tenant’s subtenants and their respective agents, employees, contractors and invitees. 1.5 Agreed interest Rate. The term “Agreed Interest Rate” shall mean that interest rate determined as of the time it is to be applied that is equal to the lesser of (i) the higher of five percent (5%) in excess of the discount rate established by the Federal Reserve Bank of San Francisco as it may be adjusted from time to time, or ten percent (10%) per annum, or (ii) the maximum interest rate permitted by Law. 1.6 Base Monthly Rent. The term “Base Monthly Rent” shall mean the fixed monthly rent payable by Tenant pursuant to Section 3.1 which is specified in Section K of the Summary. 1.8 Commencement Date. The term “Commencement Date” is the date the Lease Term commences, which term is defined in Section 2.2. 1.9 Common Area. The term “Common Area” shall mean all areas and facilities within the Project that are not designated by Landlord for the exclusive use of Tenant or any other lessee or other occupant of the Project, including, without limitation, the parking areas, access and perimeter roads, pedestrian sidewalks, landscaped areas, trash enclosures, recreation areas and the like. 1.10 Common Operating Expenses. The term “Common Operating Expenses” is defined in Section 8.2. 1.12 Effective Date. The term “Effective Date” shall mean the date the last signatory to this Lease whose execution is required to make it binding on the parties hereto shall have executed this Lease. 1.13 Event of Tenant’s Default. The term “Event of Tenant’s Default” is defined in Section 13.1. 1.14 Hazardous Materials. The terms “Hazardous Materials” and “Hazardous Materials Laws” are defined in Section 7.2E. 1.15 Insured and Uninsured Peril. The terms “Insured Peril” and “Uninsured Peril” are defined in Section 11.2E. 1.16 Law(s). The term “Law(s)” shall mean any judicial decision, statute, constitution, ordinance, resolution, regulation, rule, administrative order or other requirement of any municipal, county, state, federal or other governmental agency or authority having jurisdiction over the parties to this Lease or the Premises, or both, in effect either at the Effective Date or any time during the Lease Term. 1.17 Lease. The term “Lease” shall mean the Summary and all elements of this Lease identified in Section U of the Summary, all of which are attached hereto and incorporated herein by this reference. 1.18 Lease Term. The term “Lease Term” shall mean the term of this Lease, which shall commence on the Commencement Date and, unless sooner terminated pursuant to this Lease, shall continue for the period specified in Section J of the Summary. 1.19 Lender. The term “Lender” shall mean any beneficiary, mortgagee, secured party, ground or underlying lessor, or other holder of any Security Instrument now or hereafter affecting the Project or any portion thereof. 1.20 Permitted Use. The term “Permitted Use” shall mean the use specified in Section N of the Summary, and no other use shall be permitted. 1.21 Premises. The term “Premises” shall mean that space described in Section D of the Summary that is within the Building. 1.23 Private Restrictions. The term “Private Restrictions” shall mean all recorded covenants, conditions and restrictions, private agreements, reciprocal easement agreements, and any other recorded instruments affecting the use of the Premises and/or the Project which exist as of the Effective Date and/or which are recorded after the Effective Date. 1.24 Real Property Taxes. The term “Real Property Taxes” is defined in Section 8.3. 1.25 Rent. The term “Rent” or “rent” shall mean, collectively, Base Monthly Rent, Additional Rent and all other payments of money payable to Landlord under this Lease, whether or not such payments are specifically denominated as rent hereunder. 1.26 Rentable Area. The term “Rentable Area” as used in this Lease shall mean, with respect to the Premises, the rentable square feet set forth in Section D of the Summary, and, with respect to the Project, the rentable square feet set forth in Section E of the Summary (subject to reformulation pursuant to Section 1.32 below). Landlord and Tenant agree that (i) each has had an opportunity to determine to its satisfaction the actual area of the Project, the Building and the Premises, (ii) all measurements of area contained in this Lease are conclusively agreed to be correct and binding upon the parties, even if a subsequent measurement of any one of these areas determines that it is more or less than the amount of area reflected in this Lease, and (iii) any such subsequent determination that the area is more or less than shown in this Lease shall not result in a change in any way of the computations of rent, improvement allowances, or other matters described in this Lease where area is a factor. 1.27 Rules and Regulations. The term “Rules and Regulations” shall mean the rules and regulations attached hereto as Exhibit G and any amendments or supplements thereto and any additional rules and regulations, all as may be adopted and promulgated by Landlord from time to time. 1.28 Scheduled Commencement Date. The term “Scheduled Commencement Date” shall mean the date specified in Section I of the Summary. 1.29 Security Instrument. The term “Security Instrument” shall mean any ground or underlying lease, mortgage or deed of trust which now or hereafter affects the Project (or any portion thereof), and any renewal, modification, consolidation, replacement or extension thereof. 1.30 Summary. The term “Summary” shall mean the Summary of Basic Lease Terms executed by Landlord and Tenant that is part of this Lease. 1.31 Tenant’s Alterations. The term “Tenant’s Alterations” shall mean all improvements, additions, alterations and fixtures installed in the Premises by or for the benefit of Tenant following the Commencement Date which are not Trade Fixtures. 1.32 Tenant’s Share. The term “Tenant’s Share” shall mean the percentage obtained by dividing Tenant’s Rentable Area by the Project Rentable Area, which, as of the Effective Date, is the percentage identified in Section G of the Summary. In the event Tenant’s Share is reformulated in accordance with this Section 1.32, Landlord shall promptly provide Tenant notice of such reformulation, together with a written statement showing in reasonable detail the manner in which Tenant’s Share was reformulated and a list of all items of Common Operating Expenses which will be accounted for using the reformulated percentage. Any items of Common Operating Expenses to which the reformulated share is not applied shall be accounted for using the original Tenant’s Share set forth in Section G of the Summary. 1.33 Trade Fixtures. The term “Trade Fixtures” shall mean (i) Tenant’s inventory, furniture, signs, business equipment and other personal property, and (ii) anything affixed to the Premises by Tenant at its expense for purposes of trade (except replacement of similar work or material originally installed by Landlord) which can be removed without material injury to the Premises unless such thing has, by the manner in which it is affixed, become an integral part of the Premises. 2.1 Demise of Premises. Landlord hereby leases to Tenant, and Tenant hereby leases from Landlord, for the Lease Term upon the terms and conditions of this Lease, the Premises for Tenant’s own use in the conduct of Tenant’s business together with (i) the non-exclusive right to use the number of Tenant’s Allocated Parking Stalls within the Common Area (subject to the limitations set forth in Section 4.6), and (ii) the non-exclusive right to use the Common Area for ingress to and egress from the Premises. Landlord reserves the use of the exterior walls, the roof and the area beneath and above the Premises, together with the right to install, maintain, use and replace ducts, wires, conduits and pipes leading through the Premises in locations which will not materially interfere with Tenant’s use of the Premises. 2.2 Commencement Date. Landlord shall construct improvements set forth in the Work Letter attached hereto as Exhibit C in accordance with Landlord and Tenant’s mutually agreed improvement schedule, which such improvements may or may not occur prior to the Commencement Date. Such improvements to the Premises shall not affect the Commencement Date set forth herein. 2.3 Construction of Improvements. Landlord shall construct certain improvements that shall constitute or become part of the Premises if required by, and then in accordance with, the terms of the Work Letter attached hereto as Exhibit C (and, if Exhibit C is left blank, then Landlord shall not be obligated to construct any improvements to the Premises). Except as specifically provided in Exhibit C attached hereto, Landlord shall have no obligation whatsoever to in any way alter or improve the Premises. Tenant acknowledges that it has had an opportunity to conduct, and has conducted, such inspections of the Premises as it deems necessary to evaluate its condition. Except as otherwise specifically provided herein, Tenant agrees to accept possession of the Premises in its then existing condition “AS-IS”, including all patent and latent defects. Tenant’s taking possession of any part of the Premises shall be deemed to be an acceptance by Tenant of any work of improvement done by Landlord in such part as complete and in accordance with the terms of this Lease, subject to Landlord’s obligations, if any, under Exhibit C attached hereto. 2.4 No Roof Rights. In no event shall Tenant have any rights whatsoever to use all or any portion of the roof of the Building, it being understood and agreed that Landlord expressly reserves the right to use (and/or permit others to use) the roof of the Building in its sole and absolute discretion. 2.5 Early Occupancy. If Tenant enters or permits its Agents to enter the Premises prior to the Commencement Date with the written permission of Landlord, it shall do so upon all of the terms of this Lease (including its obligations regarding indemnity and insurance) except those regarding the obligation to pay rent under this Lease, which shall commence on the Commencement Date. 3.1 Base Monthly Rent. Commencing on the Commencement Date and continuing throughout the Lease Term, Tenant shall pay to Landlord the Base Monthly Rent set forth in Section K of the Summary. 3.2 Additional Rent. Commencing on the Commencement Date and continuing throughout the Lease Term, Tenant shall pay the following as additional rent (the “Additional Rent”): (i) any late charges or interest due Landlord pursuant to Section 3.4; (ii) Tenant’s Share of Common Operating Expenses as provided in Section 8.1; (iii) Landlord’s share of any Transfer Consideration received by Tenant upon certain assignments and sublettings as required by Section 14.1; (iv) any legal fees and costs due Landlord pursuant to Section 15.9; and (v) any other sums or charges payable by Tenant pursuant to this Lease. 3.3 Payment of Rent. Concurrently with Tenant’s execution of this Lease, Tenant shall pay to Landlord the amount set forth in Section L of the Summary as prepayment of rent for credit against the first installment(s) of Base Monthly Rent. All rent required to be paid in monthly installments shall be paid in advance on the first day of each calendar month during the Lease Term. If Section K of the Summary provides that the Base Monthly Rent is to be increased during the Lease Term and if the date of such increase does not fall on the first day of a calendar month, such increase shall become effective on the first day of the next calendar month. All rent shall be paid in lawful money of the United States, without any abatement, deduction or offset whatsoever (except as specifically provided in Sections 11.4 and 12.3), and without any prior demand therefor. Rent shall be paid to Landlord at its address set forth in Section R of the Summary, or at such other place as Landlord may designate from time to time. Tenant’s obligation to pay Base Monthly Rent and Tenant’s Share of Common Operating Expenses shall be prorated at the commencement and expiration of the Lease Term. 3.4 Late Charge and Interest. Tenant acknowledges that late payment by Tenant to Landlord of Rent under this Lease will cause Landlord to incur costs not contemplated by this Lease, the exact amount of which is extremely difficult or impracticable to determine. Such costs include, but are not limited to, processing and accounting charges, late charges that may be imposed on Landlord by the terms of any Security Instrument, and late charges and penalties that may be imposed due to late payment of any Additional Rent. Therefore, if any installment of Base Monthly Rent or any payment of Additional Rent or other rent due from Tenant is not received by Landlord in good funds by ten (10) days from the applicable due date, Tenant shall pay to Landlord an additional sum equal to five percent (5%) of the amount overdue as a late charge. The parties acknowledge that this late charge represents a fair and reasonable estimate of the costs that Landlord will incur by reason of late payment by Tenant. In no event shall this provision for a late charge be deemed to grant to Tenant a grace period or extension of time within which to pay any rent or prevent Landlord from exercising any right or remedy available to Landlord upon Tenant’s failure to pay any rent due under this Lease in a timely fashion, including any right to terminate this Lease pursuant to Section 13.2C. If any rent remains delinquent for a period in excess of thirty (30) days then, in addition to such late charge, Tenant shall pay to Landlord interest on any rent that is not paid when due at the Agreed Interest Rate following the date such amount became due until paid. 3.5 Security Deposit. Concurrently with its execution of this Lease, Tenant shall deposit with Landlord the amount set forth in Section M of the Summary as security for the performance by Tenant of its obligations under this Lease, and not as prepayment of rent (the “Security Deposit”). Landlord may from time to time apply such portion of the Security Deposit as is necessary for the following purposes: (i) to remedy any default by Tenant in the payment of rent; (ii) to repair damage to the Premises caused by Tenant; (iii) to clean the Premises upon the expiration or sooner termination of the Lease; and/or (iv) to remedy any other default of Tenant to the extent permitted by Law, including, without limitation, on account of damages owing to Landlord under Section 13.2, and, in this regard, Tenant hereby waives any restriction on the uses to which the Security Deposit may be put contained in California Civil Code Section 1950.7. In the event the Security Deposit or any portion thereof is so used, Tenant agrees to pay to Landlord promptly upon demand an amount in cash sufficient to restore the Security Deposit to the full original amount. Landlord shall not be deemed a trustee of the Security Deposit, may use the Security Deposit in business, and shall not be required to segregate it from its general accounts. Tenant shall not be entitled to any interest on the Security Deposit. If Landlord transfers the Premises during the Lease Term, Landlord may pay the Security Deposit to any transferee of Landlord’s interest in conformity with the provisions of California Civil Code Section 1950.7 and/or any successor statute, in which event the transferring Landlord will be released from all liability for the return of the Security Deposit. 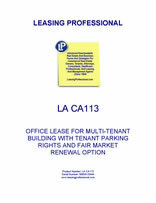 If Tenant performs every provision of this Lease to be performed by Tenant, the unused portion of the Security Deposit shall be returned to Tenant (or the last assignee of Tenant’s interest under this Lease) within fifteen (15) days following the expiration or sooner termination of this Lease and the surrender of the Premises by Tenant to Landlord in accordance with the terms of this Lease. If this Lease is terminated following an Event of Tenant’s Default, the unpaid portion of the Security Deposit, if any, shall be returned to Tenant two (2) weeks after final determination of all damages due Landlord, and, in this respect, the provisions of California Civil Code Section 1950.7 are hereby waived by Tenant. 4.1 Limitation on Use. Tenant shall use the Premises solely for the Permitted Use specified in Section N of the Summary and for no other purpose whatsoever without the prior written consent of Landlord, which consent may be withheld and/or conditioned by Landlord in its sole and absolute discretion. Tenant shall not do anything in or about the Premises which will (i) cause structural injury to the Building, or (ii) cause damage to any part of the Building except to the extent reasonably necessary for the installation of Tenant’s Trade Fixtures and Tenant’s Alterations, and then only in a manner which has been first approved by Landlord in writing. Tenant shall not operate any equipment within the Premises which will (i) materially damage the Building or the Common Area, (ii) overload existing electrical systems or other mechanical equipment servicing the Building, (iii) impair the efficient operation of the sprinkler system or the heating ventilating or air conditioning (“HVAC”) equipment within or servicing the Building, or (iv) damage, overload or corrode the sanitary sewer system. Tenant shall not attach, hang or suspend anything from the ceiling, roof, walls or columns of the Building or set any load on the floor in excess of the load limits for which such items are designed nor operate hard wheel forklifts within the Premises. Any dust, fumes, or waste products generated by Tenant’s use of the Premises shall be contained and disposed so that they do not (i) create an unreasonable fire or health hazard, (ii) damage the Premises, or (iii) result in the violation of any Laws. Tenant shall not change the exterior of the Building or install any equipment or antennas on or make any penetrations of the exterior or roof of the Building. Tenant shall not commit any waste in or about the Premises, and Tenant shall keep the Premises in a neat, clean, attractive and orderly condition, free of any nuisances. If Landlord designates a standard window covering for use throughout the Building, Tenant shall use this standard window covering to cover all windows in the Premises. Tenant shall not conduct on any portion of the Premises or the Project any sale of any kind, including, without limitation, any public or private auction, fire sale, going-out-of-business sale, distress sale or other liquidation sale. 4.2 Compliance with Regulations. Tenant shall not use the Premises in any manner which violates any Laws or Private Restrictions which affect the Premises. Tenant shall abide by and promptly observe and comply with all Laws and Private Restrictions. Tenant shall not use the Premises in any manner which will cause a cancellation of any insurance policy covering the Premises, the Building, Tenant’s Alterations or any improvements installed by Landlord at its expense or which poses an unreasonable risk of damage or injury to the Premises. Tenant shall not sell, or permit to be kept, used, or sold in or about the Premises any article which may be prohibited by the standard form of fire insurance policy. Tenant shall comply with all reasonable requirements of any insurance company, insurance underwriter or Board of Fire Underwriters which are necessary to maintain the insurance coverage carried by either Landlord or Tenant pursuant to this Lease. 4.3 Outside Areas. No materials, supplies, tanks or containers, equipment, finished products or semi-finished products, raw materials, inoperable vehicles or articles of any nature shall be stored upon or permitted to remain outside of the Premises. 4.4 Signs. Tenant shall not place on any portion of the Premises any sign, placard, lettering in or on windows, banner, displays or other advertising or communicative material which is visible from the exterior of the Building without the prior written approval of Landlord. All such approved signs shall strictly conform to all Laws, Private Restrictions, and any sign criteria established by Landlord for the Building from time to time, and shall be installed at the expense of Tenant. Tenant shall maintain such signs in good condition and repair, and, upon the expiration or sooner termination of this Lease, remove the same and repair any damage caused thereby, all at its sole cost and expense and to the reasonable satisfaction of Landlord. Notwithstanding the forgoing, Tenant’s existing signage is approved by Landlord. 4.5 No Light, Air or View Easement. Any diminution or shutting off of light, air or view by any structure which may be erected on the Project or any lands adjacent to the Project shall in no way affect this Lease or impose any liability on Landlord. 4.6 Parking. Tenant is allocated and shall have the non-exclusive right to use the non-exclusive parking spaces located within the Project from time to time, for its use and the use of Tenant’s Agents, in common with other tenants of the Project, up to, but not exceeding, the lesser of (i) the number of allocated parking spaces set forth in Section H of the Summary, or (ii) the Tenant’s Share of the non-exclusive parking spaces available for use within the Project from time to time (which as of the Effective Date is the percentage set forth in Section G of the Summary), the location of which parking spaces may be designated from time to time by Landlord. Tenant shall not at any time use more parking spaces than the number so allocated to Tenant or park its vehicles or the vehicles of others in any portion of the Project not designated by Landlord as a non-exclusive parking area. Tenant shall not have the exclusive right to use any specific parking space. If Landlord grants to any other tenant the exclusive right to use any particular parking space(s), Tenant shall not use such spaces. Tenant shall not park or store vehicles at the Project for more that (24) hours without the Landlord’s written consent in Landlord’s sole and absolute discretion. Such unauthorized vehicles may be towed at Tenant’s expense. Landlord reserves the right, after having given Tenant reasonable notice, to have any vehicles owned by Tenant or Tenant’s Agents utilizing parking spaces in excess of the parking spaces allowed for Tenant’s use to be towed away at Tenant’s cost. All trucks and delivery vehicles shall be (i) parked in such areas as Landlord may designate from time to time, (ii) loaded and unloaded in a manner which does not interfere with the businesses of other occupants of the Project, and (iii) permitted to remain on the Project only so long as is reasonably necessary to complete loading and unloading. In the event Landlord elects or is required by any Law to limit or control parking in the Project, whether by validation of parking tickets or any other method of assessment, Tenant agrees to participate in such validation or assessment program under such rules and regulations as are from time to time established by Landlord. 4.7 Rules and Regulations. Landlord may from time to time promulgate such Rules and Regulations applicable to the Project and/or the Building as Landlord may, in its sole discretion, deem necessary or appropriate for the care and orderly management of the Project and the safety of its tenants and invitees. Such Rules and Regulations shall be binding upon Tenant upon delivery of a copy thereof to Tenant, and Tenant agrees to abide by such Rules and Regulations. If there is a conflict between the Rules and Regulations and any of the provisions of this Lease, the provisions of this Lease shall prevail. Landlord shall not be responsible for the violation by any other tenant of the Project of any such Rules and Regulations. 4.8 Telecommunications. The use of the Premises by Tenant for the Permitted Use specified in Section N of the Summary shall not include using the Premises to provide telecommunications services (including, without limitation, Internet connections) to third parties, it being intended that Tenant’s telecommunications activities within the Premises be strictly limited to such activities as are incidental to general office use.